through the Saturday of that arrival week. 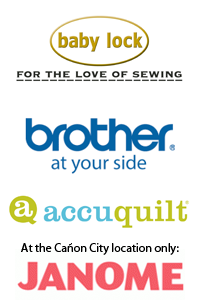 For example, if new fabric arrives on Tuesday, it will be marked with a "NEW" tag and discounted 20% through Saturday of the same week. 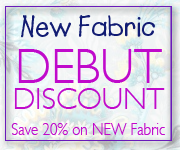 If new fabric arrives on Friday, it will be discounted 20%, but only for Friday and Saturday. All “NEW” signs, on the fabric, will be taken down every Saturday after we close, and the “New Fabric Debut Discount” will start fresh every Monday. PLEASE NOTE: Minimum 1 yard cut, maximum 3 yard purchase. Cannot be combined with other discounts or reward coupons. No online sales. OVER THE PHONE SALES: Yes! We will accept over-the-phone orders. You will be responsible for the shipping and handling charges. Credit card payments will be accepted. DISCOUNT NOT APPLICABLE TO SPECIAL ORDER FABRICS. 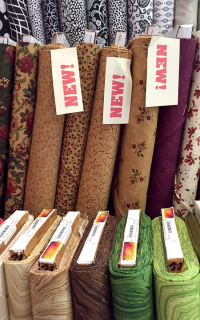 We keep our “New Fabric Arrivals” list current, so you can continually check the website to see our new lines. All NEW "tags" will be taken off the new fabric bolts, and removed from the "New Fabric Arrivals" online list every Saturday, to get ready for the next batch of new fabric.